The Indian-Americans have a moral duty to prevent India from being labeled as a “Country of Particular Concern” by the United States Commission on International Religious Freedom (USCIRF). If India were to be ascribed with such a label, it would hinder the flow of foreign direct investments and subsequent reversal of economic prosperity achieved in the last twenty years. This label may not affect the poor Indians, but it will severely impact all those Indians working in information technology related jobs and businesses involved in software development and services. South Africa once was an apartheid nation, and its prosperity came to a grinding halt when the foreign corporations realized that they are supporting a regime that discriminates her citizens. The harassment, lynching, and killing of Dalits, Muslims, Christians, Sikhs and others in India needs to stop; if not, it will hurt all Indians as the investors will start pulling out of the country. Who wants to invest in a place where their investment is not secure? The success of the American economy is based on the rule of law, the law is enforced equally, and no criminal will get away with the power of his or he monies. If someone violates the rules, the individual or the company will pay the penalty, and this builds confidence and trust in the society and frees them from tensions. Every Indian should feel secure about his or her faith, ethnicity, language and culture. Ambassador Sam Brownback had once said that the prosperity of a nation hinges on religious freedom. Indeed, the success of a country is directly proportional to religious liberty. It frees people from the daily tensions of what to eat, drink, wear and believe. It allows them to become a productive employee to the company, and a fully participating member of the family by giving the family the full attention it deserves instead of worrying about a fellow employee at the place of work. Furthermore, the quality of life is directly proportional to freedom from religious and cultural tensions. The sense of security is diminishing rapidly. A Christian is apprehensive of going to the Church on a Sunday, and a Muslim is afraid of storing meat in his refrigerator should the vigilantes descend on him. The women including little girls are not safe either. The murderers and rapists got felicitated with Garlands from among the current leaders instead of sending them to prison. The man who lynched and brutally killed a Muslim man was videotaped and shared on WhatsApp, and the lyncher was rewarded with a party ticket to contest elections. This is shamefully a weekly occurrence. Ambassador Brownback had once said referring to mob violence around the world. If the leaders respond immediately to such incidents and tell the nation that the lynching and harassment of fellow citizens will not be acceptable, then the violence will cease or at least mitigate. Unfortunately, the current Indian leadership has remained silent when vigilantes kill and maim the people, causing every Indian to live in fear – both the minorities and the ones who frighten. Please note that Hindutva ideology propagated by RSS and its family of parties is not Hinduism. Hindutva is to Hinduism; what Islam is to Islamists. Hindutva and Islamist are anti-Hinduism and anti-Islam respectively. It may take a few generations for Hindutvadis and Islamists to see the value of respecting the otherness of the other and accepting the God-given uniqueness of the other. When we get there, conflicts will fade, and solutions emerge. Ultimately, every Indian wants to live in peace and feel secure about his faith and focus on contributing to the common good of the nation. The Indian Americans have equal access to all the opportunities in the market without discrimination, and I hope the Indian Americans would want India to treat her minorities as America does hers. It is an embarrassment to note that a few Indian Americans don’t want Muslims, Christians, and Dalits to have equal rights in India. On top of it, they are poisoning their children with ill-will towards each other. The good news is that most of the American Indian youth are rejecting the ugliness of their parents and choose to respect the otherness of the other. After all, they have to work with people of different faiths and races, and it would be a pain for them to work with others if their parents have dumped their biases on their children. Should parents poison their children? We appeal to all the India oriented American organizations including the Hindu America Foundation, the Indian American Muslim Council, Federation of Indian American Christian Organization of North American to support our petition. The petition will be addressed to the Government of India to issue Visa’s to the Commissioners of USCRIF. They can do the investigations about the plight of Kashmiri Pandits, Sikh Genocides, Gujarat Massacre, Lynching and harassment of Dalits, Muslims, Christians, Sikhs, and others. If India gets a “Clean Chit” it will ensure continued prosperity and investor confidence in India’s democracy. However, if the Indian government is found guilty of the violations of religious freedoms, then two choices left to deal with are; risk losing the confidence of the investors in the stability of India, or fix the problems and earn a clean chit. Every Indian American must ensure the sustainability of India’s democracy and prosperity. 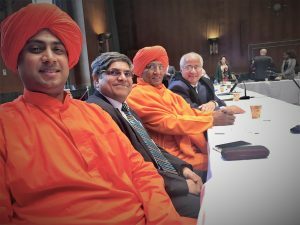 In Washington DC, there are three Indians who regularly attend the meetings about religious freedom issues from among about seventy-five individuals to talk about the concerns in different nations. Jay Kansara has been representing the Hindu America Foundation, John Prabhudoss represents Federation of Indian American Christians of North America, and Mike Ghouse serves the Center for Pluralism, standing up for the rights of people from all faiths. Now, Ajit Sahi of Indian American Muslim Council has joined the group to address Religious freedom issues of Indian minorities. The Dalits and Sikhs have been represented on an off by different visitors. 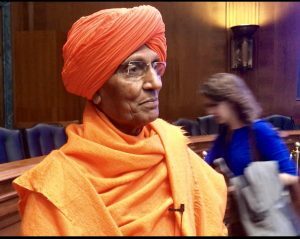 Swami Agnivesh was in Washington DC and spoke to a group of defenders of religious freedom across the world. The Ambassador of religious liberty Hon. Sam Brownback presided the meeting. He was eloquent and precise, and it was an honor to meet the man whom I have come to admire for his stand on eradicating bonded labor, and fighting for religious freedom of all Indians. Full speech of Swami Agnivesh. Moreover, the perpetrators of this violence are directly linked with the RSS, which is the mother organization of Prime Minister Narendra Modi’s BJP party. Especially since Mr. Modi became India’s prime minister in 2014, the attacks on the religious minorities have sharply increased. Armed mobs owing allegiance to the RSS and other Hindu groups have been lynching to death Muslims at will, accusing them of eating beef or slaughtering a cow. Such Hindu mobs also disrupt mixed-religion weddings in which the groom is Muslim, and the bride is Hindu because they don’t want Hindu girls to marry Muslim boys. There have been instances in which such Muslim grooms have been killed, too.